Published by: Delta Vision Publishing, Z-Man Games, Inc. In Fae, first released as Clans, each player is trying to achieve victory by scoring as many points for their color as they can. This is tricky as each player's color is chosen at random and kept hidden until the end of the game. Each region of the board contains five areas, each one of five different types. Each area receives one hut each of five different colors. On their turn, a player moves all huts from one area containing less than seven to an adjacent area, all the while trying to hide which color is theirs. After moving, if one or more areas are completely surrounded by empty areas, they are scored. If all colors are present in a scoring, any colors with only one hut present are removed. The epoch track allows a limited number of areas to score before the game ends, and each scoring will either gain a bonus or score nothing depending on the terrain type in which scoring occurred and how far along the track the game has progressed; each scoring advances the track, and each section of the track gives different terrain types bonuses and penalties. Lost in the Fae and hounded by enigmatic spirits, the brave druids of the Baruitha clan gather to perform sacred rituals in honor of these mystic denizens. Appeasing the creatures may be critical to the clan's survival in this extraordinary realm. 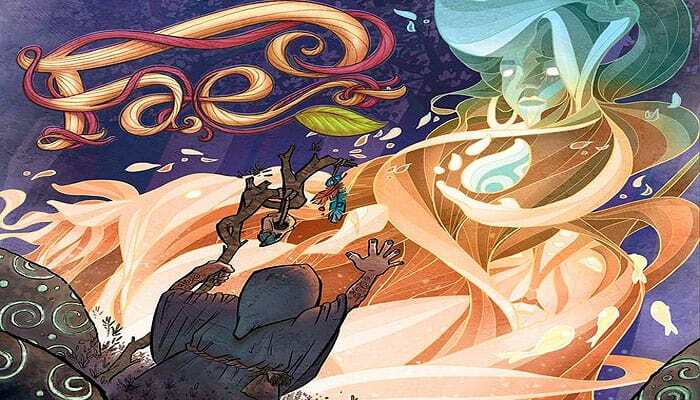 In Fae, 2-4 players assume the roles of wayward spirits within the mystic realm of the Fae, obscuring their identities from each other while influencing and luring the lost druids throughout the strange lands.